If you could get a thousand dollars for every chicken wing you ate, you might possibly be swimming in wads of cash by now. Well she wasn't actually swimming in it, but meet the woman who found $5000 inside her chicken wings pack. Selena Avalos, a woman from San Jose, California, ordered Domino's chicken wings for lunch last Tuesday. 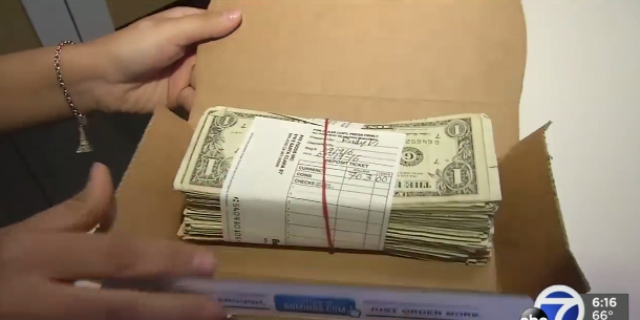 But instead of the chicken wings, she received a box filled with thousands of dollars in cash instead. According to ABC 7 News, Avalos initially thought her order had been swapped for breadsticks when she saw the box — but then she opened it and found the $5,000. Jackpot maybe? Not really—it turned out it was a big mistake by Domino's franchise. Not surprisingly, she was confused. "Wouldn't they be thinking, 'Where did that money go?'" she asked. Honesty took over from there. Being an extremely awesome and honest human, Avalos, who is the manager at Spacetel Wireless, got in touch with the Domino's franchise owner and returned the money. Check out the rewards she got for being honest. Besides good karma, Avalos will receive free pizza from Domino's for an entire year and a week off with pay from her employer. Best wrong order ever, probably. Wouldn't you like to order some Domino's chicken wings today?